I’m not kidding, the Monarch. During the Monarchs’ (Danaus plexippus) spring 2014 migration from Mexico north to Canada, I spied only one Monarch butterfly flitting in my gardens. Do I subscribe to the canary-in-the-coal-mine scary scenario of doom-n-gloom as to why the Monarch is rarer than it used to be? Or do I assume that the visitation of only one Monarch, one particular spring, is just a fluke and it’ll never happen again? That there will be plenty of Monarchs, wafting their way through my gardens this autumn (now!) as they migrate through Texas on their way to their Mexican wintering grounds? I know some Austin gardeners have already spotted Monarchs in their gardens. The milkweed that grew in my gardens during the fall 2013 migration did not survive our chilly winter–I lost the last of my plants in the hard freeze in early March. I couldn’t find any milkweed replacements during, what should have been, the spring Monarch migration. As it turned out, it didn’t matter. There were no Monarchs in my gardens, save that one. 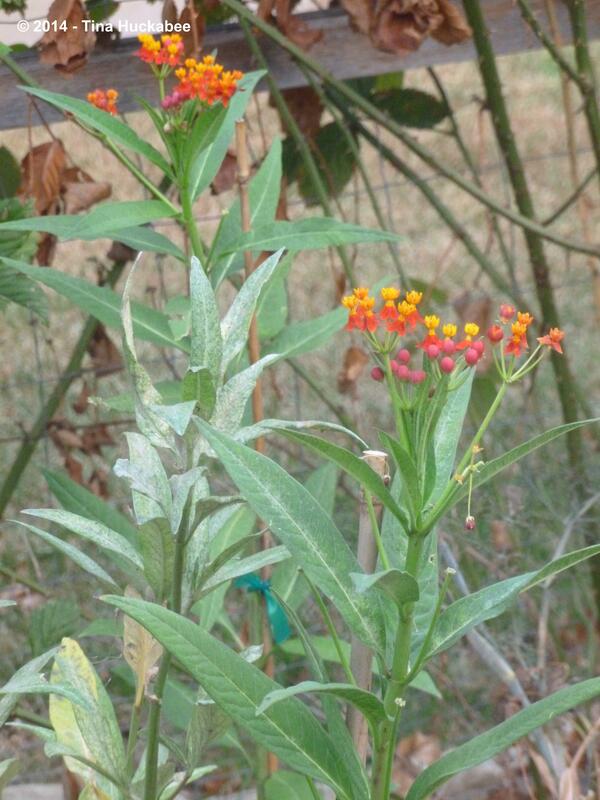 …of Tropical Milkweed, Asclepias curassavica, in preparation for the onslaught of monarchs through Texas: primarily as a nectar source during the fall migration, hopefully as a larval food source in the spring migration. 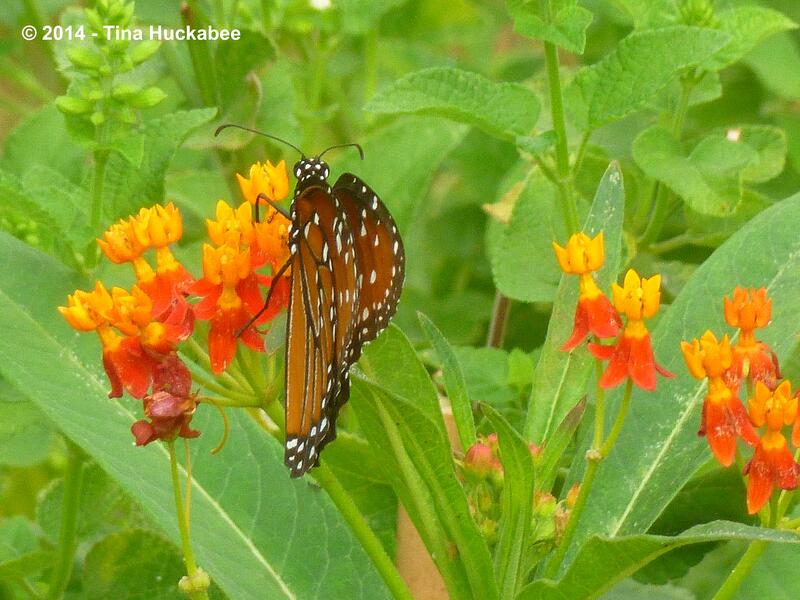 Our native milkweed varieties are not easy to find in nurseries and can be fussy to grow. 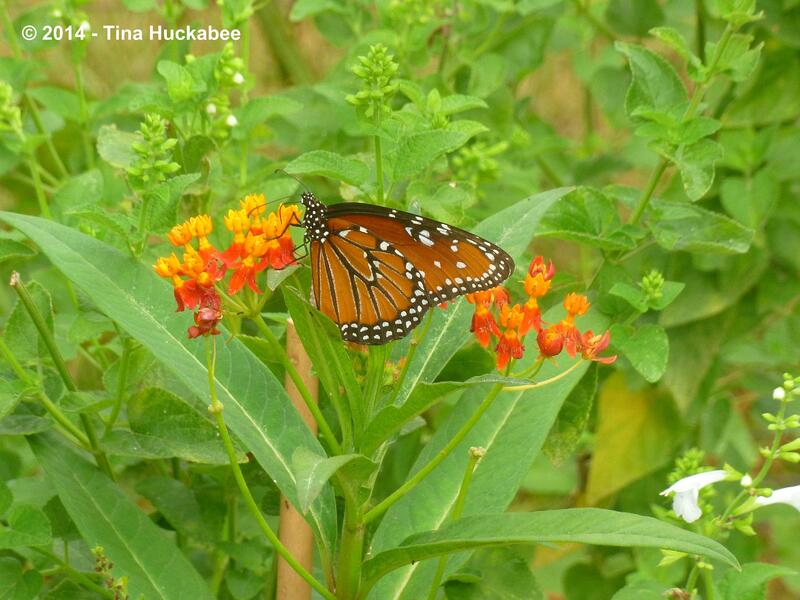 If you want to know more about the milkweed choices for Central Texas, check out this great blog, Texas Butterfly Ranch, by Monika Maeckle. She profiles beautifully the various milkweed species for this area. 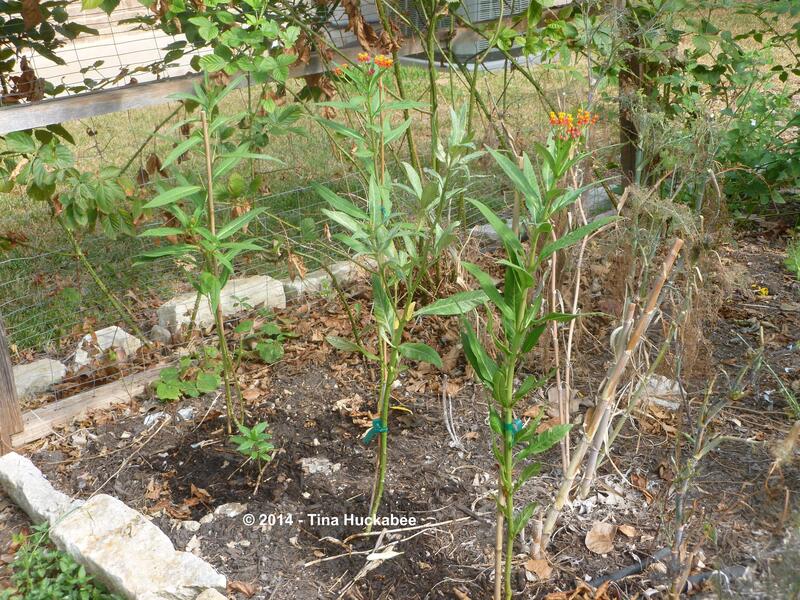 Being a native plant enthusiast (though not a purist–I have plenty of non-natives happily ensconced in my gardens), I’ve always felt a little guilty about planting the Tropical Milkweed, rather than growing the true Texas native milkweed varieties. However, Monika puts my uneasy shame at rest: she states that in her experience, the Monarchs prefer the A. curassavica. She quotes Dr. Chip Taylor, founder of Monarch Watch, who suggests that Tropical Milkweed is the plant that Monarchs evolved on. That’s good enough for me! There are in fact many different species of milkweed (Asclepias). 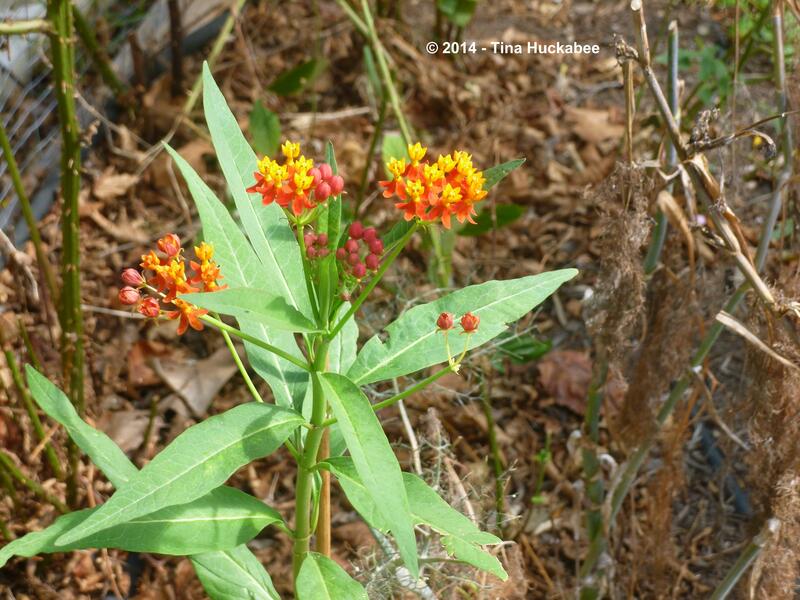 According to a blog post on MonarchWatch.org there are 73 species of Asclepias native to the United States; I counted 46 species listed in the Lady Bird Johnson Wildflower Center’s plant database. 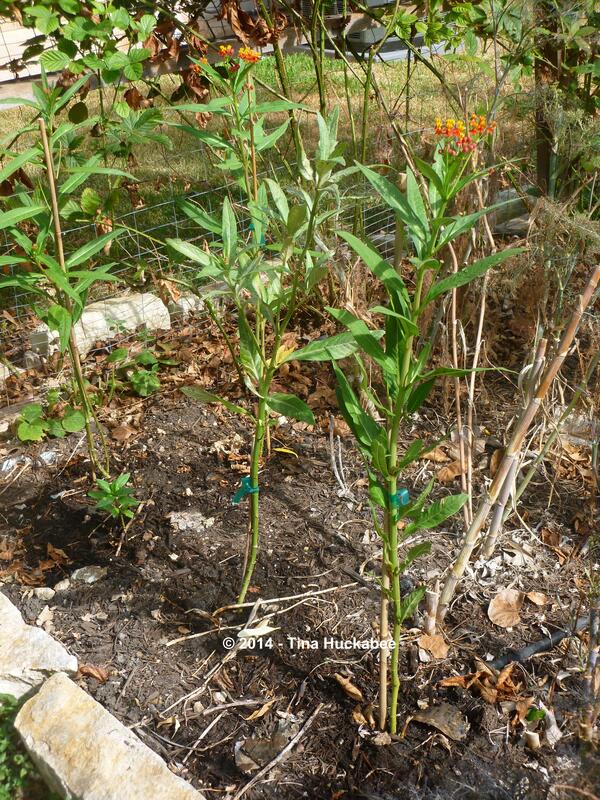 Milkweed plants are short-lived perennials, difficult to propagate, and don’t necessarily seed out readily. When they do, they might produce many seeds, but it could be years before mature plants are ready for migrating/breeding monarchs and their munching caterpillars. Milkweed plants have “specialized requirements,” meaning that they’re hard to grow and therefore, vulnerable because of that. That milkweed species are the hosts for the Monarch butterfly means that Monarchs require these plants for their survival. Along its migration route, the Monarch female lays her eggs on available milkweed leaves. The eggs hatch and the voracious caterpillars eat the leaves of the milkweed plants. And eat. And eat. They eat the leaves during the course of their caterpillar growth cycle. After gorging on milkweed for just over a week, they morph into their transformational chrysalis and later emerge, as adult butterflies with wings, prepared to continue their remarkable migration. There are several generations of monarchs participating in this migration, from Mexico to Canada and back again–all within a year. The first generation flies from the Mexican wintering grounds to Central Texas, where they eat, mate and lay eggs. Those eggs hatch, eat milkweed leaves, transform to the adult butterfly, and continue migrating to the grasslands of the Midwest. Females lay more eggs, those eggs hatch, caterpillars eat the milkweed species available there, morph into adults and continue the migration to Canada and repeat the process there. There are three to four generations through the summer, all requiring the milkweed host plants to continue the development of the next generation. The last leg of their life cycle, the migration south to Mexico, is important because even though the Monarch isn’t breeding at that point, it is drinking nectar that will sustain it through its 2000-mile migration and its winter in Mexico. Even without outside encroachment, the thriving of Monarchs and their milkweed plant hosts, hangs, just a little, in the balance of everything working out, just right. In the last 20 years, there has been a 90% decline of this iconic and beautiful insect, which is the butterfly that most of us know. 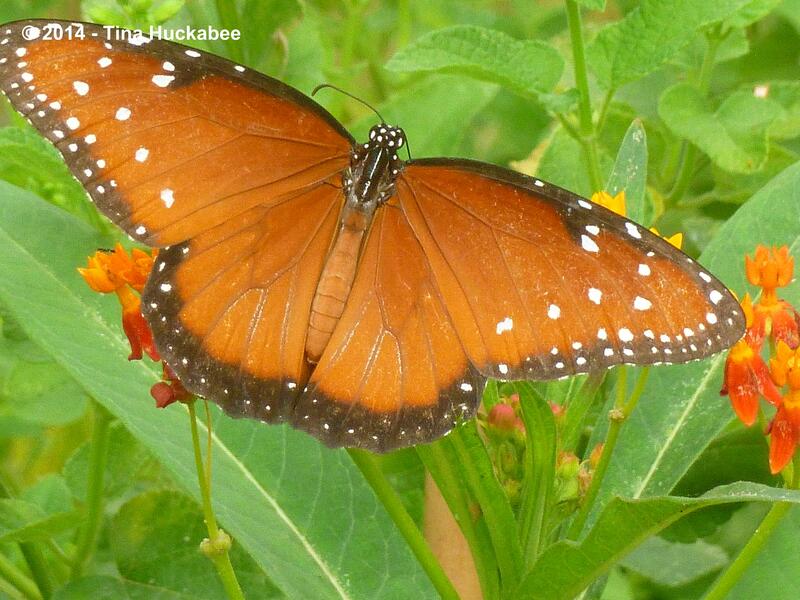 Even if we don’t know the name of any other butterfly, we know the Monarch. Essentially, there are three main threats to the survival of this North American butterfly. The first is the rapid deforestation of the mountain forest habitats that the Monarchs hang out (literally) in for the winter. The Mexican government has stepped in to reduce illegal logging, but the damage is done and it will be hard to recover the forest habitat that provides cover and sanctuary for the Monarchs. The second is the occurrence of severe weather patterns, in Mexico, and all along the migration routes in the U.S., which deliver extreme cold and/or severe drought conditions hampering the growth of host plants or killing caterpillars or emerging butterflies. Obviously, if there is a wet and hard freeze in the mountains where the monarchs rest for winter, many will die. And that has happened. As well, if there are no milkweed plants for caterpillars or nectar producing flowers for adults along the migration routes because of drought or extreme freezes, there won’t be food sources for the totality of the butterfly life cycle–egg, larva, adult. That has happened too. The severe drought in Texas in these past couple of years is a good example of this problem. Since the extreme drought of 2011 and the continuing moderate drought since, there are fewer nectar sources to strengthen the adult Monarchs on their way to Mexico for the winter. Scientists believe that whatever monarchs that made it to Mexico in the last couple of years, many probably weren’t strong enough to survive the winter there. By far though, according to most sources, the chief reason that there is such a steep decline in Monarch numbers has to do with the methods of agriculture production in the United States. The Monarchs’ migration and breeding path is along the grasslands of the central part of the U.S., the Midwest. That is also where industrial agriculture is planting genetically modified crops, like corn and soybean, in huge, wide areas. Those genetically modified crops are developed to resist the herbicide Roundup. Therefore, the use of Roundup has increased, because the agricultural crops can withstand the chemical used to kill unwanted plants/weeds. Herbicides don’t discriminate. The chemicals kill “weeds” that the agriculture business doesn’t want, but also kills any other plants, including milkweed and other pollinator plants that it comes in contact with. Roundup kills plants–all emergent plants, except for those genetically modified to resist it. It’s as simple as that. So there we are. Because of the overuse of a herbicide, there’s not enough milkweed to sustain the several generations of Monarchs as they migrate, mate and lay eggs, chow on milkweed leaves, then become adult butterflies ready to continue their incredible migration, from Mexico to Canada and back again. Not enough milkweed. Or for that matter, any other flowering plants for other pollinators like bees and other butterflies. Better living through chemistry? Certainly not in this case. Even Monsanto, who produces Roundup, is finally realizing there’s a problem, but considering that they produce the genetically modified seeds, as well as the Roundup, I’m left cold with their concern. Conservation groups have recently filed a petition to list the Monarch butterfly as “threatened” under the Endangered Species Act. To list the Monarch as a threatened species will take time, continuing research, lots of data, and political will. But the ball is rolling and there is hope. There are organizations, some listed below, but there are many more, that exist to educate about and promote for the survival of the Monarch butterfly, as well as other species of pollinators, birds, and well, so many other critters in the natural world which are getting squeezed out of existence. Please support them–both the organizations and the wildlife. There are usually simple, effective, and organic remedies to address many garden problems caused by insect damage and diseases. Please don’t purchase and use chemicals, like herbicides and pesticides, in your gardens: you’ll not only save money, but maybe a species or two. Plant for pollinators, birds, and other wildlife–their survival depends upon us and the plants they like are pretty–you’ll like them too. I promise. Wildlife appropriate plants are great to grow: they are very easy, don’t require as much water as traditional “landscape” plants, and are beautiful in the garden. I promise. I haven’t seen a Monarch yet and it’s about time for them to make their appearance as they migrate to Mexico. 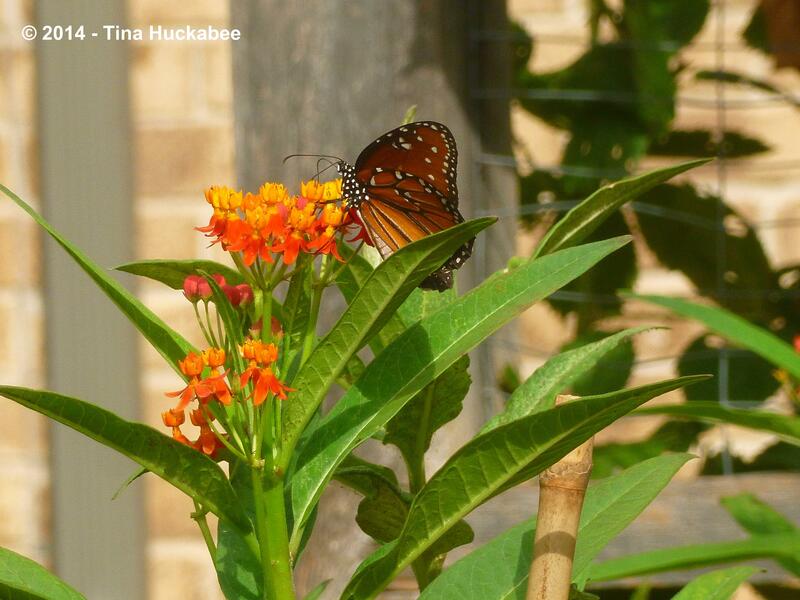 My milkweed is planted for the Monarchs’ dining needs and my gardens host many other blooming perennials as well. …but there are no Monarchs yet. Check out these sites. There are many other articles about this issue. This entry was posted in Danaus plexippus, Monarch Butterfly, Uncategorized and tagged Danaus plexippus, Monarch Butterfly by Tina. Bookmark the permalink. Tina, thanks for this important wake up call as to how dire the situation is for monarchs. All my non-native milkweed were lost to freezes last winter. When I tried to buy more last Spring they were all sold out. Honestly, I rarely see monarchs here no matter what I’ve got planted. But after reading this I am by golly going to make a special trip to the nursery to see if I can get tropical milkweed. And I have native milkweed seeds to cold stratify and try for next Spring. I was happy to see, according to one of the sites you linked to, that at least I have other nectar plants in play here (verbena, daisy, coneflower, cosmos, impatiens). We’ve got to do all we can to save these amazing creatures! I knew the populations were down and I was vaguely aware of why–all three reasons. But when I read that there was a petition to list the monarch as “threatened”, I was shocked. I just didn’t know how serious the problems were. I hope this is a wake up. The Audubon Society just issued a dire and depressing report on the status of North American birds–yet another serious set of problems. Good for you that you’re aware and willing to grow what you can in your plot of the Earth, to help things along. A great post, really interesting. I think as gardeners we have a really important role to provide a safe, nectar- rich environment and to grow as many native plants as possible. I had to look up Monarch butterfly; it is so beautiful, but so is your Queen butterfly. Stunning. I’ve seen two Monarchs so far, one in my own garden and another at gardens where I volunteer. The milkweed is out there. I have noticed in previous years they seem to prefer the tropical milkweed when there is a choice. We just lost a couple of miles of Antelope Horn milkweed when a nearby road was widened. So sorry that your last few Antelope Horns were destroyed–that’s the problem, isn’t it? Not enough understanding of the why’s and how’s of biological diversity. Glad you’ve seen a couple of monarchs–I seem to recall that you said last spring that you’d seen quite a few in SA? But, there was no milkweed available because of the cold winter. Poor monarchs. PS: Is that a new header shot? It is gorgeous! Ooof – OK I noticed you have rotating header shots. I guess the one I admired so (a shot of coneflowers and salvia) was simply one I had “missed” in the rotation previously. Still, it is gorgeous! The header shot is relatively new–I took that photo last spring (btw, the blue salvia is the Henry Duelberg–something to look forward to!). The header shots rotate randomly. I added that one and the one with the 4 honeybees at my blue bird bath. The remaining photos are ones I’ve had since I started blogging again last winter, though most of those are 2-3 years old. Thanks for noticing! I’m always tickled when I have a photos that I’m particularly happy with–that (and the bees) are two of them! Great info, thanks for sharing! We’ve noticed a dearth of Monarchs this year as well; we’ll definitely add some milkweed to the landscape next spring! Cheers! Good for you–poor little butterflies need all the help they can get!